Winning a championship is one of the greatest feelings a person can have. The feeling is made even sweeter if that season started off on a low point, then got worse, and was plagued by injury. 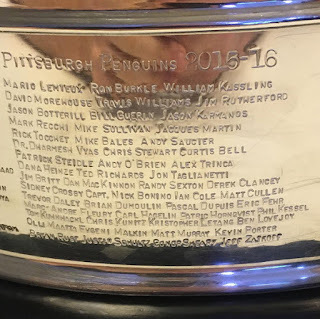 On Oct. 26th, the Penguins unveiled the etching of names on the Stanley Cup. It was official. 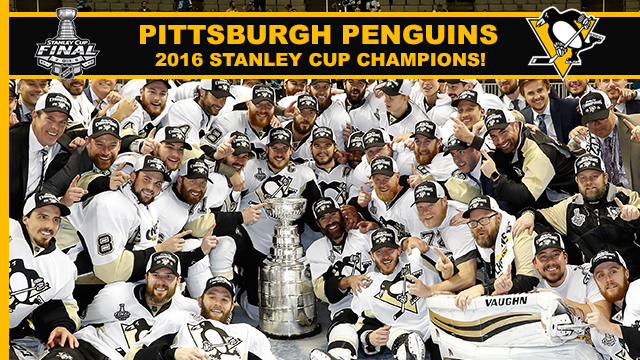 The 2015-16 Pittsburgh Penguins are part of history, engraved into the fabled chalice. Ever observant as Pens fans are, tweets began to surface all thorughout the Twitter-verse involving the names. One observation made was the possibility of Evgeni Malkin's name being misspelled. Upon further inspection (and an official announcement from the organization), it was found that it was the angles of the photos and the lighting that made the "E" look like an "F" in his first name. To be fair, the bottom line of the "E" in "Evgeni" is faint, but remember that these names are struck by hand, so it may have just been a matter of pressure on that letter at the time. 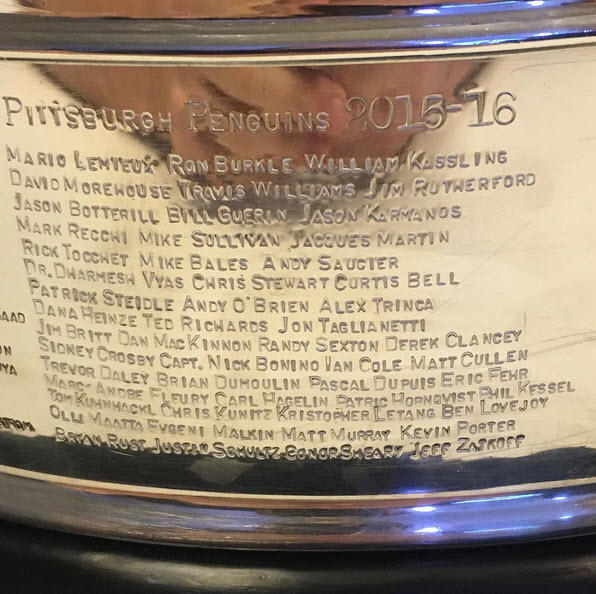 There are no spelling errors on the Cup involving the 2015-16 Pittsburgh Penguins. This (and the two tweets that followed) sent social media hockey talk into a frenzy. As people went back to the picture of the names on the Cup, they realized Bennett's name was not on it. Neither were the names of Derrick Pouliot, Steve Olesky, Scott Wilson, Oskar Sundqvist or Coach Sergei Gonchar. Bennett goes on to suggest, with the use of a hash tag, that putting his name on the Cup would be an act of plagiarism since he was not a part of the line up that earned it. Bennett sat out much of last season due to sustaining injury after injury. He would play in 33 games, none of them coming in the Stanley Cup playoffs or Final. have played in at least one game during the Stanley Cup Final. There is an exception to those rules. In 1994, the league passed an amendment allowing the winning team to petition the Commissioner to include certain names that were not able to meet the aforementioned requirements due to extenuating circumstances, and would usually have been omitted. The Penguins chose to petition for Jeff Zatkoff and Pascal Dupuis. Zatkoff earned the highest level of respect from the team and set the pace for the playoffs when he had to step in, and step up, in Game 1 against the New York Rangers. Would the series have ended differently had he not put in the effort to win that first game? Thankfully, fans did not have to find out. Pascal Dupuis' name being added had people in heated discussions. Why was he deserving and not Bennett when during the beginning of the season, as the going's were tough, Bennett was the teams 3rd leading scorer? The true answer is anyone's guess but I have a theory. Bennett was out of the line up due to injury that (assumingly) he could recover from. Once he was healthy again, the team chose to keep him off the ice in favor of such players as Bryan Rust and Conor Sheary. Dupuis had no other choice but to hang up the skates. His issues with blood clots put his life at risk too much to keep chancing it night after night. Although he loves the game and his team, he loves his family more and made the choice. There would be no coming back to play. However he stayed with the team and gave every bit of encouragement and support he could. Bennett will have more opportunities (barring injury) to add his name to the Stanley Cup. Dupuis will not (at least as of right now and definitely not as a player). Add that to the veteran leadership he brought to the locker room, the energy he added to the team, and the respect players have for him around the league and it becomes an easy decision. I am sure Bennett was a little disappointed and rightfully so. his actions and words handled the situation with maturity and understanding. The tweets were short, sweet and to the point. Bennett, who got his day with the Cup back in June and should receive a championship ring from the team, does not feel his name deserves to be on the Cup. End of Story. We wish him good luck and success on his new team, the New Jersey Devils. If you are wondering why Derrick Pouliot, Steve Olesky, Oskar Sundqvist, and Scott Wilson were omitted it is simply because they did not meet the requirements. Pouliot played in 22 games, Wilson 24 and Sundqvist only 18. Sunqvist, along with Olesky, are also still active members of the Wilkes Barre/ Scranton Penguins roster in the AHL. They all received championship rings. Fans may throw out the argument that if a player receives a ring that their name should be added to the Cup and it is a fair point. But there is only so much space to work with and that's why the rules are the way they are. It is not clear why Coach Gonchar's name was left off the list as he was hired by the team in late October of last year. The rest of the coaching staff is on there, even the video review guy. The team has not addressed it so it will remain a mystery. Kevin Porter gets the "Lucky Duck" award for the season. Though lost mid-season to the injury bug, he played in exactly 41 games to eek out qualifying to have his name on the Cup despite not being in the line up.